This isn’t an era I know much about and for some reason I’ve never been very interested in Alexander. But I’ve heard so much good about Thornton’s books that I jumped at this. And good thing that I did! The story is told from four points of views: his sister Thessalonike, his friend and sometime lover Hephaestion and wives Roxana and Drypetis, Everyone is very different so we get 4 interesting perspectives. These were strong women who knew what they wanted and were ready to fight for it, by any means necessary. And then there was Alexander’s mother Olympias who sadly wasn’t POV character. 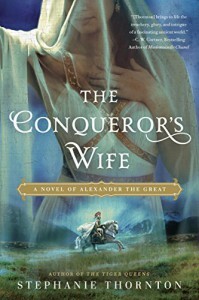 She was ruthless, calculating and ready to do anything to get Alexander into power. It would have been great to know her motives for doing things she did. We don’t get Alexander in a very good view but we see better side of him through Thessalonike’s eyes. But Roxana I loathed. She was the only character I hated and kept hoping something bad happens to her… My favourite was Hephaestion and I might have had a bit of a crush on him… I don’t care to imagine how much more destruction Alexander might have done without Hephaestion holding him back and trying to be a voice of reason. This was amazing book and it definitely won’t be the last! I need to move Daughter of the Gods up my TBR list.